Pick the day that works best for your schedule! We have 3 Events a year: Spring, Fall & Holiday! You’ll find aisles of the best bargains in gently-loved and new items at great savings! Bring your BFF and shop away! Don't forget to bring your reusable shopping bags! We gladly accept cash, debit cards, Visa® & Mastercard® credit cards for payment. Saturday, March 23rd | 8a-130p |50% off most items!! Saturday - Most items are marked for 50% off!! ***Consignor Pick up is Sat March 23rd from 7-8pm- all items not donated must be picked up by 8pm! 20,000 sq. feet of amazing deals on everything for kids- just in time for the Fall! Save 50-90% off retail prices on gently used and new items for newborn to teens! If you love a great sale, you don't want to miss this one! 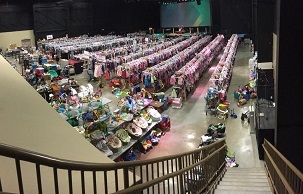 JBF is an amazing community event where you can get 50-90% off retail on thousands of brand names items for your kids. This event gives families an affordable option for items they want and need for their growing families without breaking the budget! Making money on my grandkids clothes they have out grown. Finding good deals and meeting new people. Such a huge selection of merchandise at this event and super reasonable pricing!